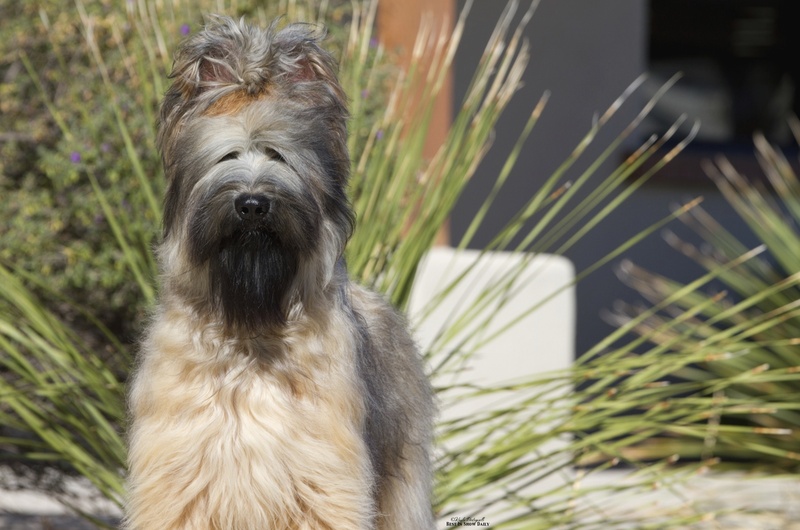 The very coat that attracts us to this beautiful breed can also be a challenge and a source of frustration for many first time Briard owners. Briards will go through many coat changes from puppyhood through adulthood. Besides the varying colors and color changes the tawny coats will undergo the coat itself is unique and different on every dog. The hair texture is not the same on each dog and the hair shaft itself can be varying thickiness giving the coat a more dense appearance or fine appearance. Black coats can sometimes be easier to handle and groom I have found over the years. If you are blessed with good texture in your puppy/dog then grooming will not be as much of a chore. But, if you have a puppy or adult dog whose coat is softer and carries more undercoat your job may be more of a challenge and require more time and care. What I have found to be true no matter what the coat texture is that if the coat is kept clean and not allowed to become severely matted or felted the job of managing the coat is much easier. There are many trains of thought with regard to bathing the Briard. My own experience tells me that keeping the dogs groomed and washed on a regular basis makes life easier. You may not want to bathe your companion every week like dogs who are being shown but the cleaner the hair the easier your job will be. Clean hair is less likely to be damaged by brushing. There are allot of quality shampoos on the market now that have correct Ph levels designed for dogs skin so the thought of frequent bathing drying out the skin and coat is not really as much of a concern. I personally bathe my dogs being shown on a weekly basis and my older dogs or my dogs that are clipped down every other week or so. I do not brush daily but have found that if I thoroughly brush through the coat on a weekly basis and address mats at that time I can keep the coat under control (the exception to this would be coats going through the change from puppy coat to more adult coat need more frequent brushing and possibly even daily care anywhere from ten months until two years of age). If there is a problem area I do not wait for the mat to set in and become felted as that is much harder to handle. I often brush a little on the dogs whose coats require more care when I am watching t.v. and am sitting on the ground with them. I have them lay on their side and I brush them.This will not damage the coat if the dogs are kept clean and the coat is dampened with a grooming spray. I try to protect every hair and avoid “weapons of mass destruction” for example harsh slicker brushes, mat splitters, and blades, etc. You will need a good quality pin brush, soft slicker and a greyhound type comb. I have some good sites for getting these items on this page below. Remember too that hair grows from the inside outward so the dog must be eating and absorbing good nutrients through its food for a healthy coat as well.